Ply Gem employee Duane Inch gave SUN Area Technical Institute‘s Masonry students and their instructor Mr. Gregory a first-hand look at the latest technology in manufactured stone. This hands-on tour included molds, manufacturing, safety, team skills, material testing, quality control measures and various product line demonstrations. Ply Gem employees over 200 local workers, many of whom are SUN Tech Alumni. Thank You Ply Gem for donating your time to give our students an in-depth, fun, and educational tour. 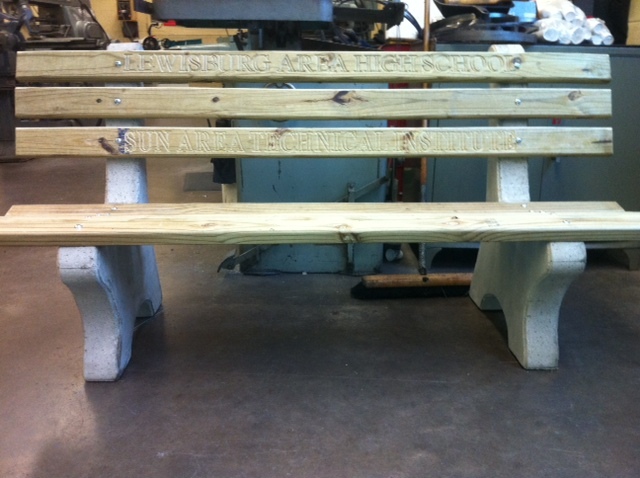 The tools of the Masonry trade are currently on display at Midd-West High School. 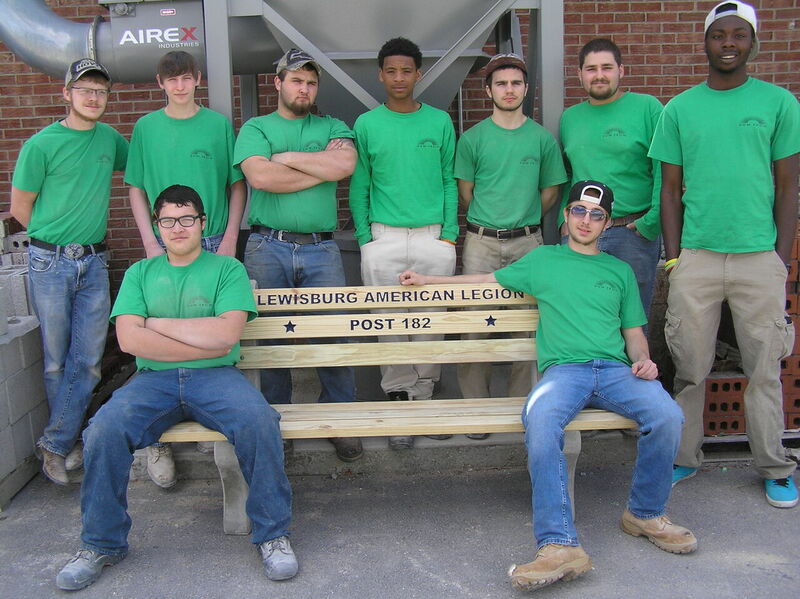 SUN Area Technical Institute’s Masonry program combines equal parts physical and mental activity. Students in Masonry learn to create quality with in brick, block, stone, and other masonry materials that will stand the test of time. Students will also develop an understanding of construction-related mathematics, blueprint reading, job site organization, and job site safety. 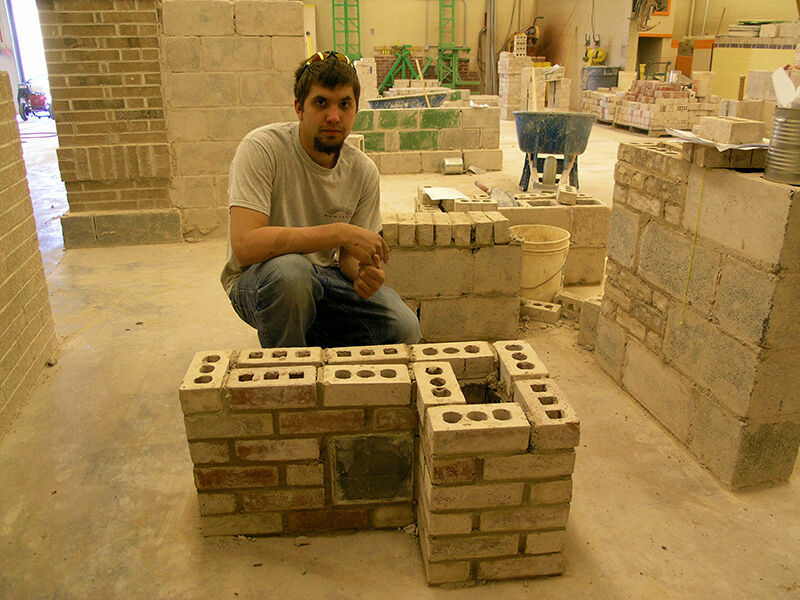 Students enrolled in SUN Tech’s Masonry program can earn college credits during their senior year of high school through the Penn College PCNow program. 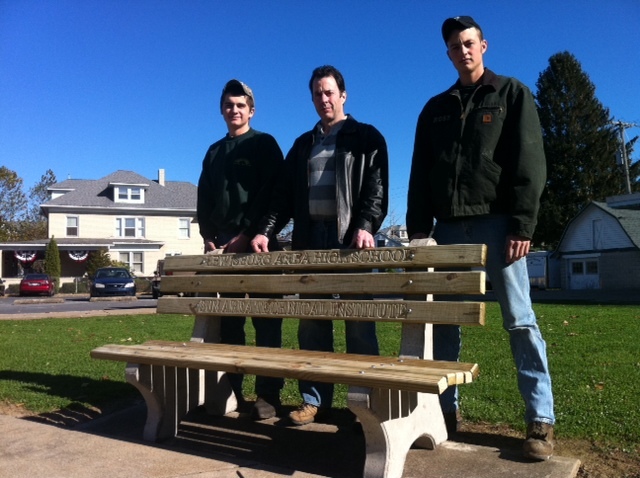 SUN Area Technical Institute’s Masonry instructor Mr. Gary Gregory and his students apply the finishing touch’s to the restoration project for The Chief Shikellamy sign. SUN Tech’s Masonry students learned several skills in the process that included brick, block and mortar removal, ordering proper material supply list, proper mixing of various colors of mortar, team work skills on work site and reconstruction of block/brick supports. 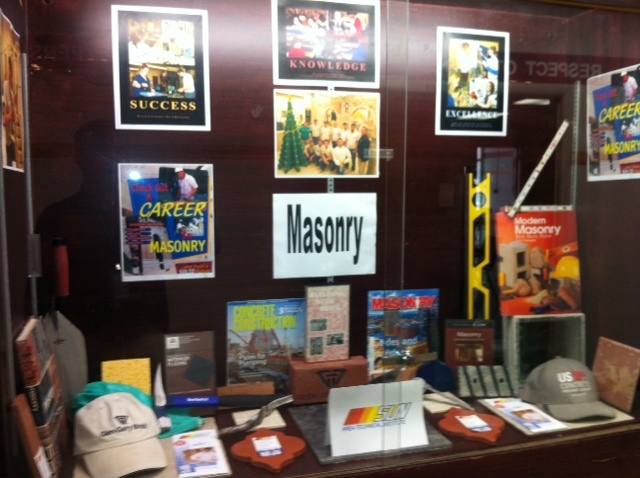 The Masonry program is being featured in the display case at Shikellamy High School. SUN Tech’s Masonry program is currently featured in the display case at Shikellamy High School. If you’re interested in attending, there’s still room in the class and still a week left to switch to SUN Tech! In Masonry students learn bricklaying, blocklaying, concrete construction, chimney and fireplace construction, tile work, material estimation, and many other skills required for a successful career in this rewarding trade! 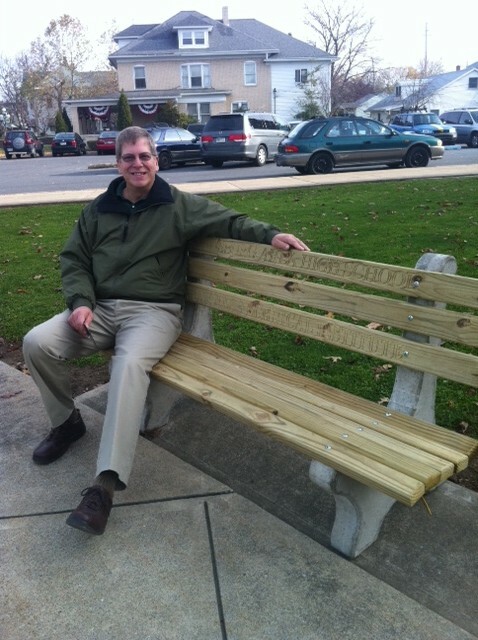 Masonry student Wayne Dressler stops for a photo with his recently finished project. Students in Masonry learn brick, block, stone, and concrete construction techniques and will graduate as expert craftsmen to whom producing square and plumb buildings is second-nature, in addition to becoming skilled artists capable of forming graceful curves and archways our of materials that aren’t known for their pliability! If you don’t mind getting dirty and working with mud and mortar, take a closer look at Masonry and ask your guidance counselor to come tour our school. To see more Masonry projects, check out our Masonry Album on Facebook. The Masonry class of 2012 poses with their unconventional class Christmas Tree. In the background you can also gorgeous archways built by the class are also visible. Welcome to the Masonry program here at SUN Area Technical Institute. Our names are Joseph “Big Guy” Dozpat from Mifflinburg, and Zachary “Curly” from Midd-West. We chose to attend SUN Tech to take advantage of a good job opportunity in a field that is growing and because we enjoy working with our hands. Masons are in high demand for both commercial and residential jobs. Some of the masons in this class have teamed up to work on a big project here in the shop to showcase the various skills we have learned this year so far. The project consists of a block wall with a height of about eight feet. Also, there is brick casing the wall with three brick arches and a full circle made of brick. We frequently go out on job sites as part of our learning experience. For instance, one of our job sites is for the New Berlin Recreational Center. We are building a garage made of split-faced block. In addition, we have the opportunity visit various businesses in the construction industry such as Central Builders Supply and Watsontown Brick. At these sites we got a first-hand look at the manufacturing process and keep informed on the latest products and techniques. These are great educational experiences. Our instructor, Gary Gregory, also known as “Mr. G”, is a very well experienced mason and at one time owned his own business. He knows a lot about the business and is a very good teacher. 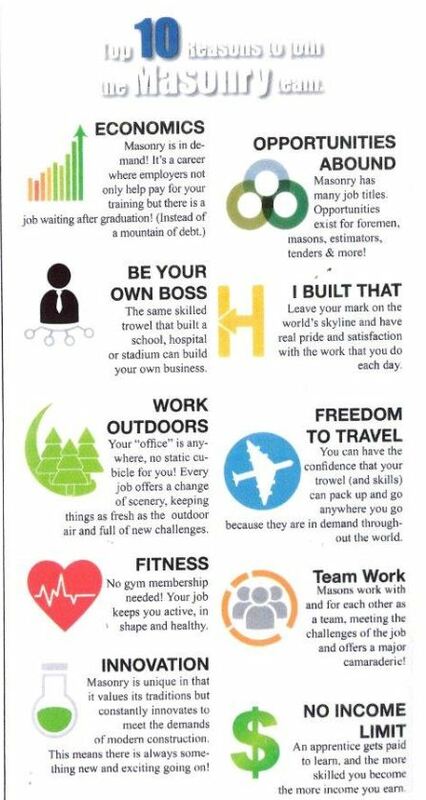 Our future plans are to further explore the masonry industry as well as secure good jobs for a big time company or even establish our own masonry business. Also, we would like to get into pouring concrete and doing more with that.